Southern Pecan Chewies are perfect for a holiday cookie tray yet simple enough to be served year round with tea or coffee. One bowl, a handful of ingredients, and 30 minutes are all you need to have a sweet treat! There is something about the holidays that makes pecan sweets and treats popular. My guess is the cost of pecans is what causes pecan sweets and treats to be so popular during the holidays. Even the most budget-conscious shopper seems to throw caution to the wind during Thanksgiving and Christmas. Don’t believe me? Find a southern friend and ask to sit at their holiday table some day. Not only will there be enough food to feed an army, but the quality of the food will be fit for a king. No expenses are spared. 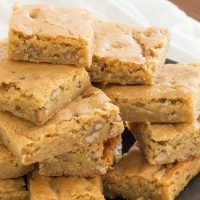 There are about as many recipes for pecan chewies and pecan chews out there as there are southern grannies. We prefer ours to be slightly chewy on the edges and soft but set in the middle. This pecan chewie recipe is what I have used for eons. It’s the first one I was taught how to make and Ithe only change I have made was to reduce the nuts. Add too many pecans and this chewie recipe takes longer to bake. That longer baking time results in a crunchier/drier edge. If you want to use extra nuts, go ahead and use them. It won’t hurt anything except maybe your wallet. 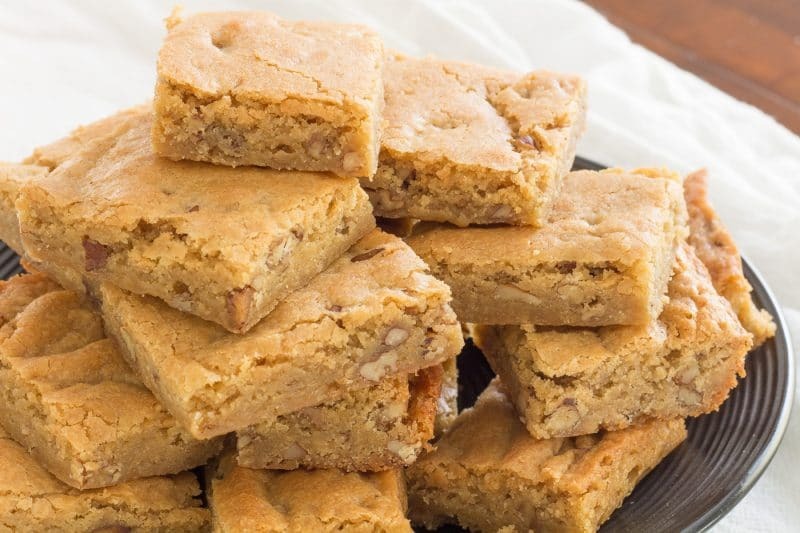 You could actually double the nuts and still, come out with a fantastic pecan bar cookie or pecan blondie. It can be called either one because it is a little bit like both! I prefer to use toasted pecans in this recipe. 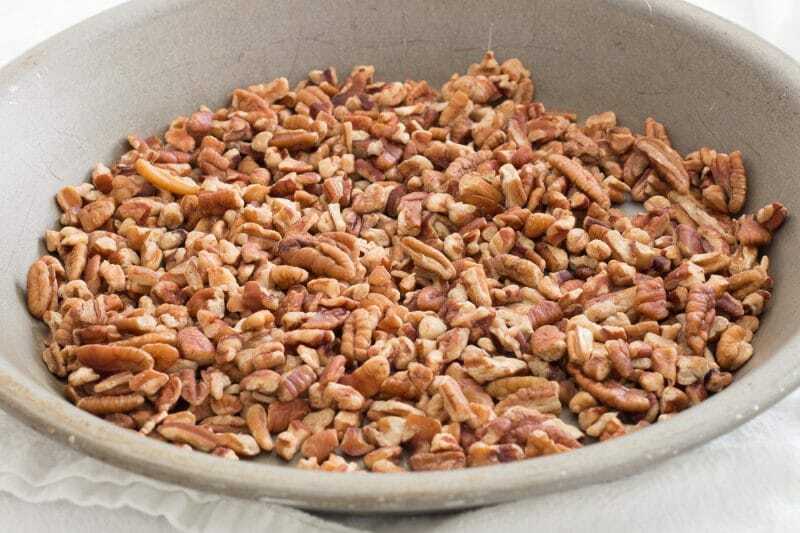 Toasted pecans will add a nice depth of flavor. 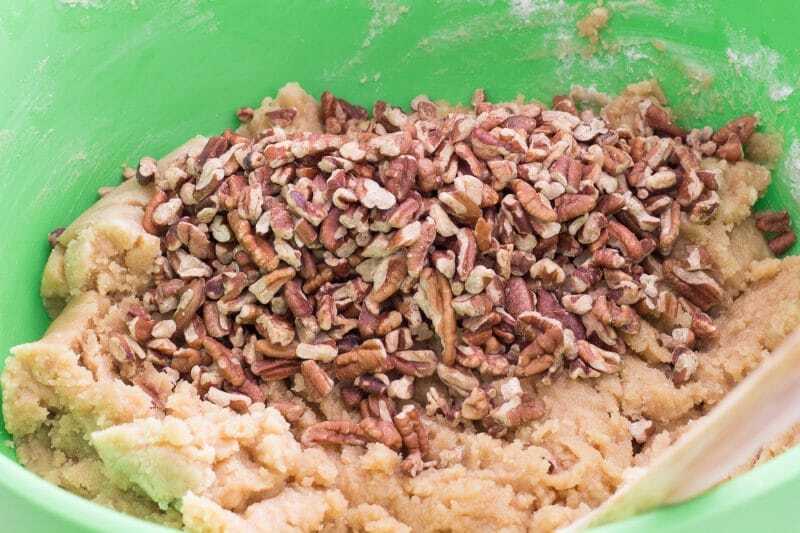 To toast pecans I measure out the amount I need for my recipe and place them into an ungreased pie tin and roast them in a 350 Degree F oven for 10 to 20 minutes, stirring even 5 minutes. 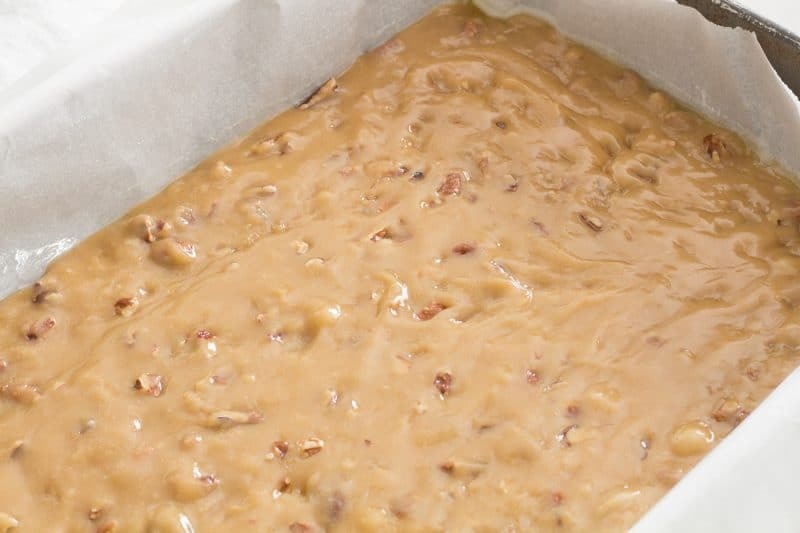 Once you are able to smell the pecans when you open the oven door, take them out and set them aside to cool. You will also see some of the pecans on the edges of the pan started to turn a darker shade of brown. This recipe can be made with a mixer, but I find it easy enough to mix up in a large bowl with a wooden spoon. The best way to keep the dish count to a minimum is to start with a microwave safe bowl for this and melt your butter right in the bowl you are about to use. One bowl, one pan, and done! Melt the butter BEFORE you add the brown sugar! Otherwise, it looks like this mess. The brown sugar will be fine in the microwave though. I was still able to salvage this batch and it tasted no different than any other batch I have ever made. Which is many! Add the eggs now, but if you forget, just add them as soon as you remember. Your first indication you forgot the eggs might be when you are trying to add it to your baking pan and wondering just how in the world you are going to get that mess evened out. Or it might happen earlier, like when it is difficult to get the pecans into the mixture. If you detect a touch of guilt in that statement it is because I have done that exact thing a time or two. Evidence that it happened this time too. I had just too much going on in the kitchen that day. We were making Italian Wedding Cookies, Knafeh, Chocolate Crinkle Cookies, and Pecan Chewies all in the same day. It happens to all of us. Right? Right?!?!?!?! This recipe is really very forgiving. I suspect you could just dump it all in together and mix it up and it would be fine. See how lovely that batter is even with adding the eggs last? It even baked up perfectly! No one except me knew I had made a mistake, until now. I share my kitchen mishaps on occasion so that beginner cooks are not afraid to make mistakes and keep on trying. Kitchen and recipe mistakes do happen, even for food bloggers! Attempting to correct errors is all part of the learning process. 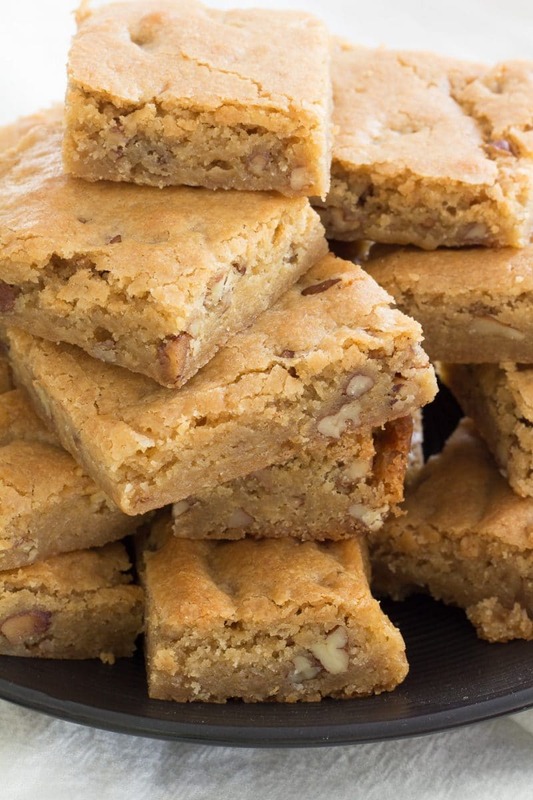 Before attempting to remove the pecan chewies from the pan, allow them to cool completely. Even if you have used parchment paper or aluminum foil to cover the pan, the chewies will be too soft and will bend in the middle. 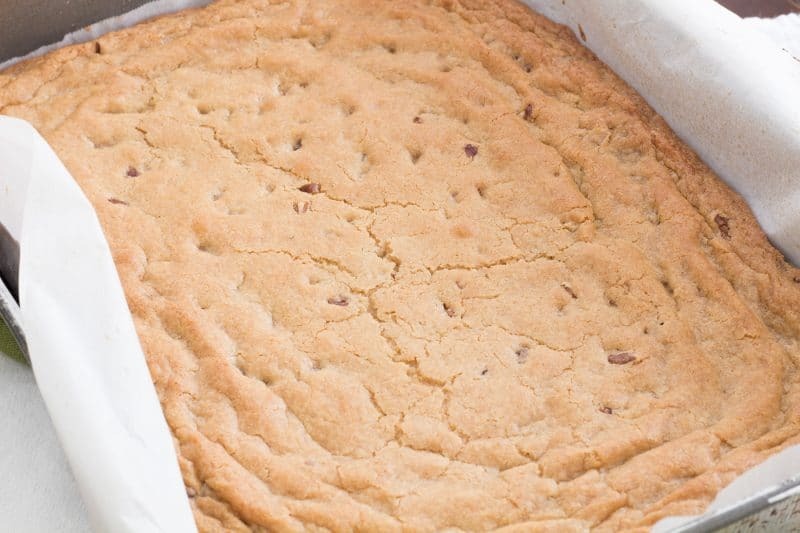 Once they have cooled, the easiest way to get them out of the pan is to slightly tip the pan towards one of the short sides and quickly slide them out of the pan using parchment paper. If you did not use parchment paper, go ahead and slice them into bars while still in the pan and gently lift them out one at a time. I just find I get cleaner cuts when I have the entire thing sitting on the counter. This allows me to take my largest knife and make one full cut across the short side. I am able to then cut more uniform squares when I am working with one cut strip at a time. Chewy pecan treat, perfect for snacks and holiday cookie trays. Prepare a 9 X 13 pan by spraying with a non-stick cooking spray or by greasing and flouring. 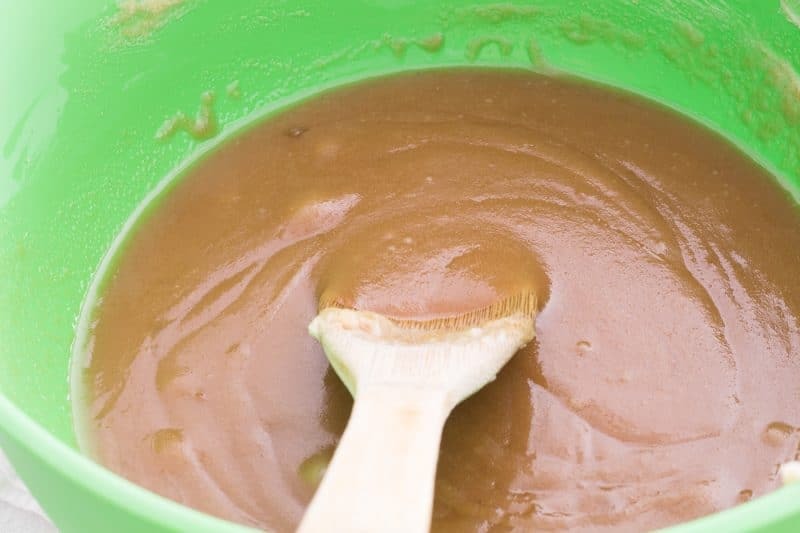 Mix melted butter and brown sugar in a large mixing bowl and stir until well combined. 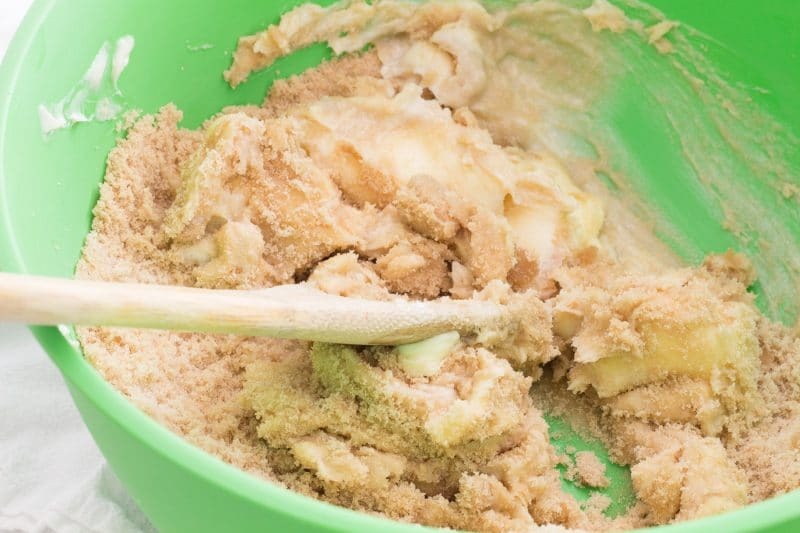 Add flour and baking powder to butter and sugar and mix until there are no white streaks left of flour left. Make sure and scrape the sides of the bowl often. Place into the preheated oven and bake for 20 to 25 minutes or until the edges begin to brown. 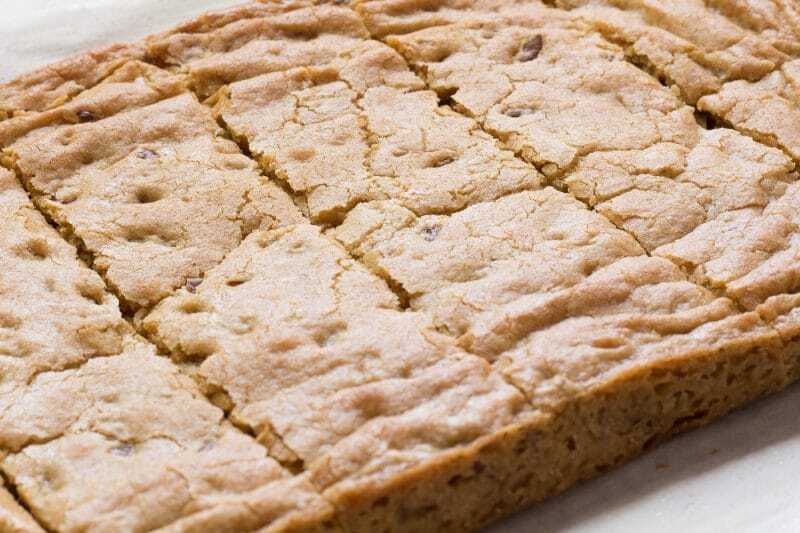 Remove from the oven and allow to cool before cutting into bars. 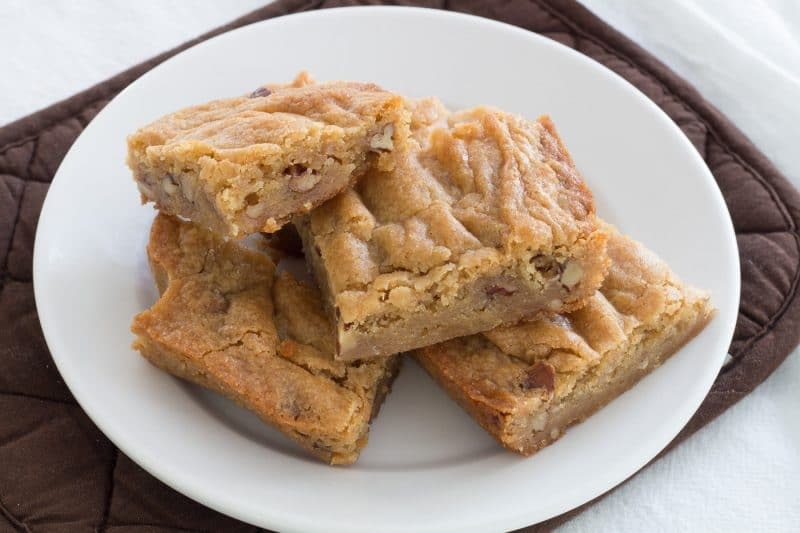 More nuts or chocolate chips can be added to this recipe. You may need to increase the baking time by 5 minutes or so. I am laughing because I understand! I forgot the eggs the day I was taking photos and realized something was wrong when I was trying to make a brown sugar brick! I’m going to straight up confess I made this recipe once and forgot the flour! Like how distracted do you have to be to realize you made brown sugar soup in a cookie pan and didn’t notice?